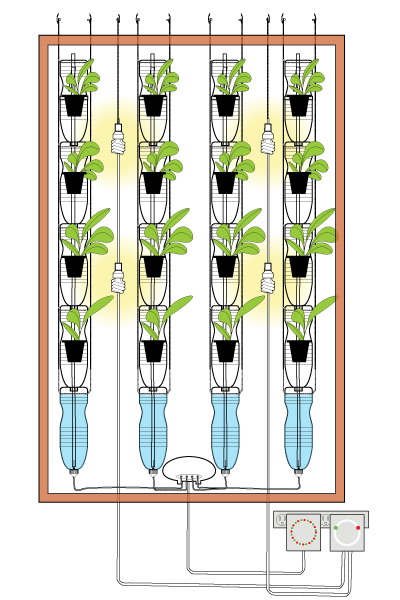 If you’ve got tools, space, a little extra time, and a knack for building things, constructing your own windowfarm gives you additional control to customize the system for your own setup. You will need to register on the community site and accept community terms of service before accessing the plans. The V2 Windowfarm allows you to start small while you get the hang of caring for just a few plants. Materials cost as little as $30 USD and the project takes about an afternoon. Please note: We are having difficulty with this file and we are experiencing an unusually heavy load of downloads. If the version you end up with is fuzzy or does not load, please come back next week and try again. In the meantime, check out modified windowfarms designs other windowfarmers have built on our community site. 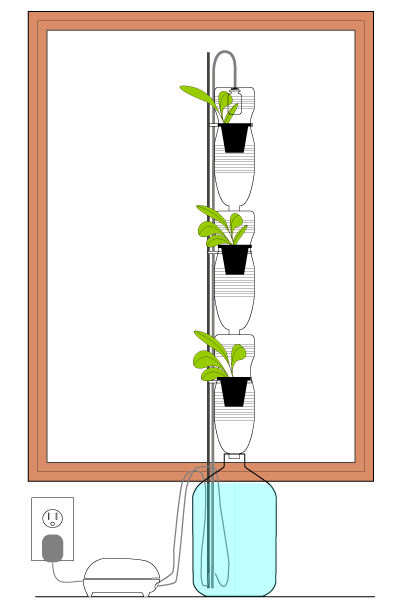 The version 3.0 Windowfarm design gives you more plants for your buck. Use one pump to supply 8-20 plants. The curved bottom reservoirs enable better use of organic nutrients. Total materials cost about $175USD with shipping. Set aside a day days to order all the parts online, several afternoons to gather recycled materials, and then about a weekend to build the system.